The rewards of working at RLI go well beyond financial compensation. RLI employees enjoy opportunities for personal and professional growth, health and wellness benefits and financial incentives that include an Employee Stock Ownership Plan (ESOP). Our outstanding employees are the foundation of RLI’s success and we remain committed to helping them secure their long-term financial future. RLI has received recognition for creating a high-quality workplace in which our employees can thrive, as well as for our industry-leading benefits package. We are honored to be a recipient of these awards, as it reinforces our focus on attracting and retaining the best employees and rewarding results-oriented performance. 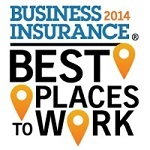 RLI named to Best Places to Work in Insurance List. RLI was recognized as one of the Best Places to Work in Insurance by Business Insurance Magazine and Best Companies Group in 2014. At RLI, we strive to provide a creative and collaborative work environment that inspires innovation. From empowering employees to take the lead on projects, to sharing the rewards of our success, we're different and that's why we are more successful than most. Click here to view the list and read more about the selection criteria. RLI recognized as a top 3 finalist for 2018 PLANSPONSOR Award. In 2018, RLI was recognized by PLANSPONSOR as a Plan Sponsor of the Year Award top three finalist in the category of Total Retirement Offering. This national honor recognizes leaders in retirement plan best practices - plan sponsors that aim to provide more secure financial outcomes for their employees. PLANSPONSOR magazine is a trusted information and solutions resource for retirement issues and benefits programs. Read more about RLI's finalist nomination. RLI encourages professional development course work in both insurance and job-related areas for its employees. We have made a commitment to employees to provide educational opportunities to help them enhance their skills and further their career advancement. RLI fosters a true learning culture and encourages professional growth of employees through participation in insurance courses, in-house training and other educational programs. RLI covers the cost for most programs and employees may receive a bonus upon successful completion of certain courses.